As many of you know by now, I am extremely anti-dog kibble. Not only is it not a well balanced, fresh meal, the links to numerous health problems and the fact that it is high heat processed and likely carcinogenic was enough for me to know I had to dump it. Also, according to Dogs Naturally magazine, a study of 522 dogs by Lippert and Sapy (2003) showed that dogs who were fed high-quality, freshly made, real food diets had an average life expectancy of 13.1 years versus just 10.4 years for dogs fed commercially processed pet food! That’s an extra THREE years, hopefully, with your favorite fur baby. Not to mention, once you get your pets off kibble or low-quality food, you will be blown away at how much healthier they become. Any skin issues or allergies will often clear up and their coat becomes so shiny and strong! 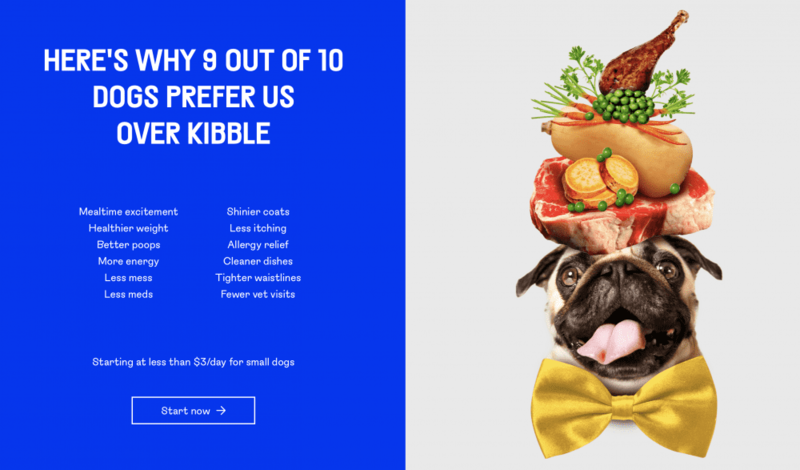 I know, it’s not always easy, financially, to eliminate kibble and make your food from home the way we do, but if your priority is your dog’s health, I wanted to at least have some better options for you all to choose from. For more reasons on why we dumped kibble, yes, even the better brands like Acana or Orijin, I highly suggest watching Pet Fooled on Netflix. But now, for my reviews! 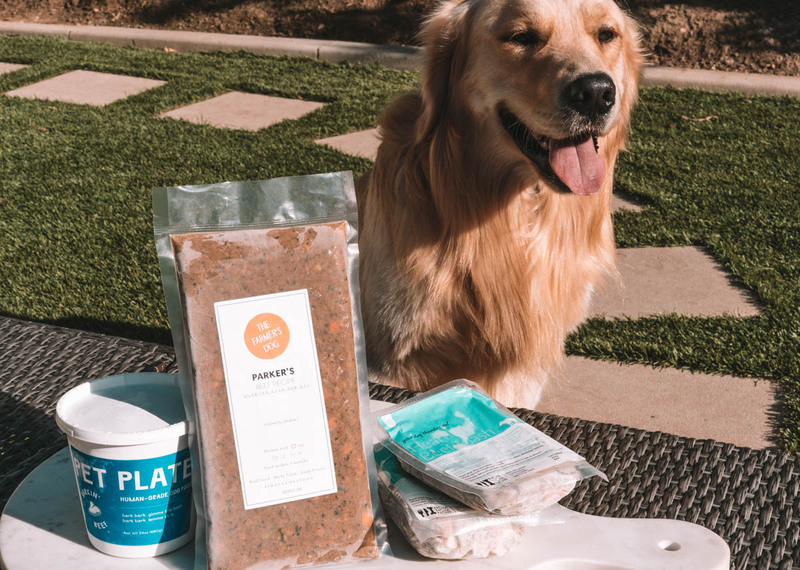 These are some of the top food delivery services for your pets so let’s check them out one by one! 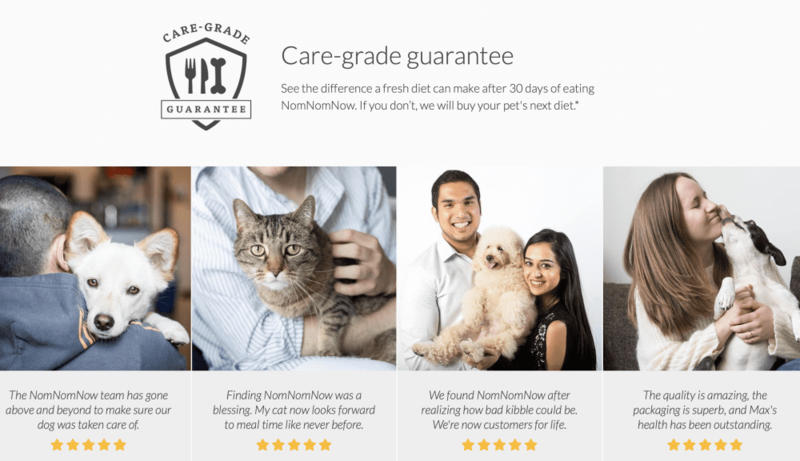 Made by a Veterinarian Nutritionist, NomNomNow makes both dog and cat food delivered right to your door. While not Organic, they do have some nice options to choose from at some very reasonable rates. This came fresh, not frozen, right to your door. Single-serve, resealable packs portioned perfectly for your dog’s weight, activity, breed and age. Meals are made with human-grade ingredients. Contains- 80 grams of Protein, 62 grams of Fat, 55 grams of Carbs. Contains their special vitamin blend including choline bitartrate, zinc gluconate, ferrous sulfate, Vitamin E supplement, copper gluconate, manganese gluconate, thiamine mononitrate (Vitamin B1), riboflavin (Vitamin B2), selenium chelate, sodium iodide, cyanocobalamin (Vitamin B12), and cholecalciferol (Vitamin D3) to provide a perfectly balanced, nutritious meal for your pet. Made with Fish Oil to help give your pet a healthier coat. They have several different blends and recipes to choose from, view them here. The website offers info on how to transition their diet over easily. No fillers, preservatives, wheat, or corn and they have Gluten-Free options! They offer free shipping on every order and their customer service is top-notch. Discounted pricing, the more you buy the better the price. They also carry probiotics, at home microbiome testing and treats! They offer meal samples and they have a 20% OFF trial you can test out here! Only 2 meals a day but, that is based off what the dog’s needs are per day, but your dog might be sad losing a meal lol. This seemed to have a bit more potatoes/carbs than I personally would like in a dog’s food. Just like sugar, carbs can lead to inflammation which then can lead to cancer. They do not allow you to choose the delivery day since it depends on your location. Some recipes include eggs and not all dogs do well with eggs so this could be an allergy to some. Cannot customize recipe combinations/portion sizes through their website, you have to call customer service. Food packs are more bulky, making it difficult to stack in the freezer. PRICE- This is based on my dog’s size, age, and serving him just two meals per day. Weekly- $71 for 14 meals. 2 Weeks- $120 for 28 meals. 4 Weeks- $220 for 56 meals. $220 a month for one 65 pound dog is the average cost. Get 20% OFF a Nom Nom Now trial here. 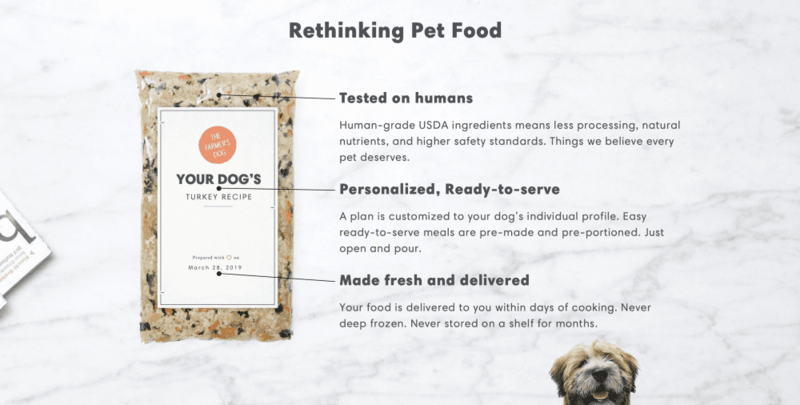 Created by a Pet Food Industry Consultant and Veterinarian Nutritionist, Pet Plate offers fresh dog food delivered straight to your door. The food comes in nice, resealable packaging. Contains their special vitamin mix which includes vitamin E, zinc oxide, ferrous fumarate, copper gluconate, manganese gluconate, potassium iodide, and vitamin D3. Recipes contain Salmon Oil to help give your pet a healthier coat. There are no eggs in any of their recipes, great for pups that are sensitive to egg! They offer a variety of recipes, all accessible to view without signing up. View them here! 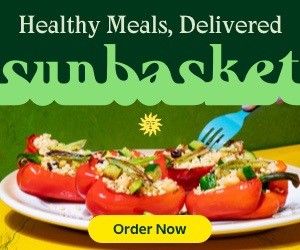 Preservative and filler-free, already cooked, just thaw and serve! 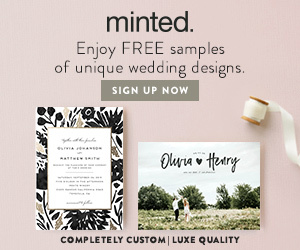 They offer 50% off your first shipment, click here to try! PetPlate offers free shipping on every order! They offer a smaller, cheaper topper plan if you just want to add to another dog food. Ability to pause, skip, or cancel the subscription at any time. This came frozen which means it needs more time to thaw out before serving but it very quickly thaws in warm water. However, it is in plastic so heating plastic does increase the risk of the plastic leaching into the food so thawing beforehand is best. Containers are not pre-portioned for each meal, you have to use the feeding table on the container to figure out how much to feed. They do not have samples, only a two-week trial period. The only subscription option is delivery every two weeks. Doesn’t support dogs that need a prescription diet or have food allergies. They do not offer a discount for subscribing to a larger delivery. They do not offer cat food yet. The plastic food containers take up more space in the refrigerator or freezer. Packaging is not sustainable and environmentally-friendly. Does not offer a pet questionnaire, so it does not select the best recipes suited for your dog. Cannot customize recipe combinations/portion sizes. Weekly- $70 for 14 meals. 2 Weeks- $140 for 28 meals. $280 a month for one 65 pound dog is the average cost. Get 50% OFF your first box of PetPlate here. The Farmer’s Dog company offers fresh dog food formulated by board-certified Veterinarian Nutritionists and delivered right to your door. For us, this was our #1 choice, here is why! Food packs arrive lightly frozen but very slim to make storing easy. Meals are packaged with environment-friendly, biodegradable packaging. They offer a pet questionnaire that takes into account your dog’s age, breed, weight, and activity level to customize your food plan. Meals are made with human-grade ingredients and gently cooked at 165 degrees to kill bacteria but not beneficial nutrients. Contains their special vitamin blend including vitamin B12 supplement, zinc amino acid chelate, iron amino acid chelate, vitamin E supplement, copper amino acid chelate, thiamine mononitrate, sodium selenite, riboflavin supplement, potassium iodide, vitamin D3 supplement, and folic acid. Contains Fish Oil to help give your pet a healthier coat. Recipes are egg-free for those sensitive to eggs. They offer a 20% OFF two week trial here. Farmer’s Dog offers free shipping on their orders! 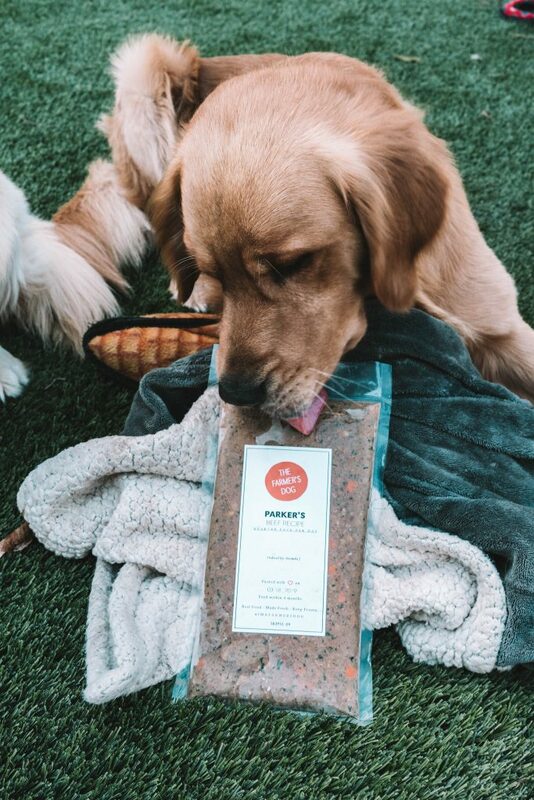 Each meal pack arrives with your dog’s name on it, perfect for those with multiple pups that may order different blends. Adjustable food blends, portion sizes, and delivery frequency. This came slightly frozen which means it needs more time to thaw out before serving but it very quickly thaws in warm water. However, it is in plastic so heating plastic does increase the risk of the plastic leaching into the food so thawing beforehand is best. An entire day’s worth of food is in one pack, so you have to portion it out. Does not offer cat food. Does not offer a discount for subscribing to a larger delivery. Food packets are not resealable. Only three recipes to choose from versus four recipes from the other companies. Some people have said the shipping can be unreliable and it’s difficult to pause or cancel their subscription. 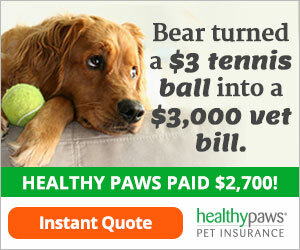 Does not have official Veterinarian endorsements like the other two companies. Get 20% OFF Farmer’s Dog here. Thank you so much for this honest review! We have been looking to make the switch but didn’t know where to start. Often times you can’t trust other ppls opinions when an affiliate code is involved so I appreciate all the extra work and research you put into this! Will help decision making much easier. 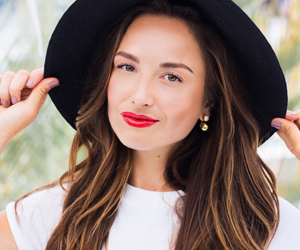 Have you tried the brand “Ollie”? 🙂 my dog loves it and would love to hear your opinion.